Concierge is the ultimate post-delivery growing assistant. When you buy herbs or veggies from us, your new garden immediately registers with our system. So the moment your plant is delivered to you, we start sending you email notifications to keep you and your plant on track as it’s growing. If you order herbs, you’ll get a delicious recipe once a week for three weeks that uses your specific herb. If you order the MoGrow system, you’ll receive two delicious recipes to use your veggies in. But here’s the really cool bit: When you order a MoGrow system, we’ll send you emails anytime we think you might need help: during inclement weather, feeding times, and the harvesting stage. 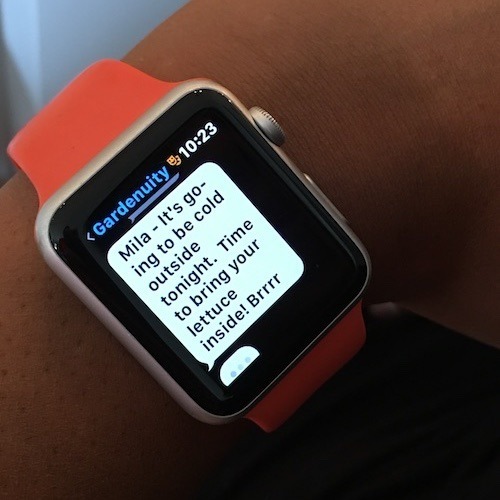 We know where you live (and not in the creepy way), so we’ll send location-specific emails about how to best tend to your MoGrow in times of bad weather or intense heat. If you have a random hot spell or rainstorm coming, we’ll send a note telling you how to handle it. We also keep track of timing. Once you receive your MoGrow, we start counting. Then, when it’s time to feed your plant, we’ll remind you. As your veggie nears harvesting time, we’ll send you an email so you know your rewards are coming soon. Fancy, huh? All of our emails come after 5:00 pm, so they don’t get lost in the work-web. Because we’re here to make growing work for you—wherever and whenever you are. September 14, 2017 by Corinne L.